September 11 2011 was the day we brought home a new Candy Purple Catrike Expedition. Little did we know where the journey would take us. March 15 2012 it was my wife's turn, coming home with a new Electric Blue Expedition. Ergo, into my teens and mid twenties I rode a bike quite a bit along with my wife; we've been together since we we teenagers. Normally that wouldn't be very important on a review but in this case its a bit relevant. After beginning a family the trusty bikes would have become rusty bikes had I not stored them properly. For 30 years. We bought some Mountain Bikes for the family about ten years earlier rode a few weeks and there they were, right next to the old road bikes with a ten year film of dust. "Lets take a ride" she said. OK, air up the tires go for a ride and, well its been a while. But despite the pains of putting on 5 miles (remember, we haven't been on a bicycle in 10 years) we discovered something we could have only dreamed about as kids - Hike & Bike Trails! Hey this was getting to be fun! Painful, yes but great fun! A few days after our first ride I spotted a Catrike 700 parked at a Wine Store. Asked the owner where he got it. That was September 10th 2011, so you can probably figure out what I did the next day. My wife wasn't sure about a trike in part because she didn't like the size of the Pocket which is what the "bikeshopdude" told her she was limited to due to her 5'2" stature. So we also bought a really nice Trek bike for her. Riding nearly every evening and both weekend days piles the miles on quickly, by February we had about 1000 miles. By then she was sure I could figure out a way to fit her properly on an Expedition. Did some fitting and measurements and came up with a plan. Shimano 27 Speed system was nearly flawless having adjusted it once when it was new and maybe tweaking it one more time afterwards. Rear spokes seemed perpetually loose after the first 300 miles, and by 500 miles had a local shop rebuild the wheel. No problem since. Pedal Steer was very noticeable over about 20 MPH. Eventually after maybe 500 miles I was able to minimize it by tempering the pedal stroke. Acetal headset bushings (Catrike thinks Acetal is Teflon) seemed to have an increasing shimmy problem from day 1. By about 500 miles I tightened them to twice the recommended torque and it hasn't been a problem since. Avid BB7 brakes worked great but squealed like a stuck pig after about 100 miles. Front end alignment seemed to drift a bit over the first 500 miles, possibly due to the headset bushing thing. Always set to 0.00" dead-ahead. Marathon Racer tires wore quickly on the front, but not the back. Forum chatter claimed it was due to the alignment, and for the first 500 miles I could accept that. The trouble is the next 300 miles they wore even faster with the wheels perfectly true. The Trykers that replaced them have a ton of miles, practically no wear. 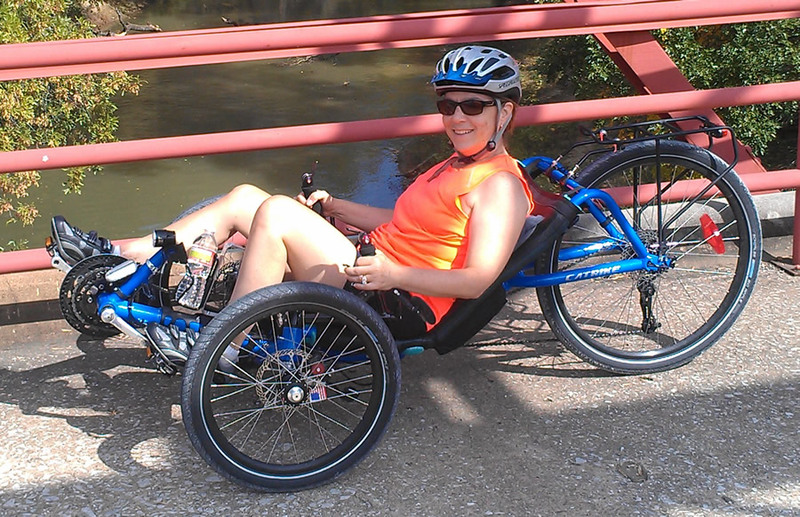 Not really sure why Catrike equips the Expedition with Marathon Racers. They aren't fast, but they aren't slow either. Speedwise they really aren't any different then the Big Apples, just not as comfortable. Fun factor was enormous. It just kept growing. Paulo came out with a grand slam winner on the Catrike. It has too much ground clearance IMO but just the same it handles really predictably. In retrospect it handles very well, but a bit tippy for my preference. Possibly the worst handling manners were also a way to learn some fun, if not dumb acrobatics. Hammer the brakes at low speeds and you do a Polish Wheelie aka "Stoppie". Hammer the brakes at high speeds and the rear sort of stays planted until you slow down to about 14-15 MPH. Hammer the brakes until just about the time the rear picks up a little then back off the right brake - and the trike begins to pivot. After a few times of that I started pitching it 180°; it took a few weeks before I began asking myself why a 50 some year old guy was doing this....and stopped with the acrobatics. Oh, yeah, remember my wife's Expedition? It actually fit her very well, much better then the Pocket or the ICE Adventure she tried out. Success. 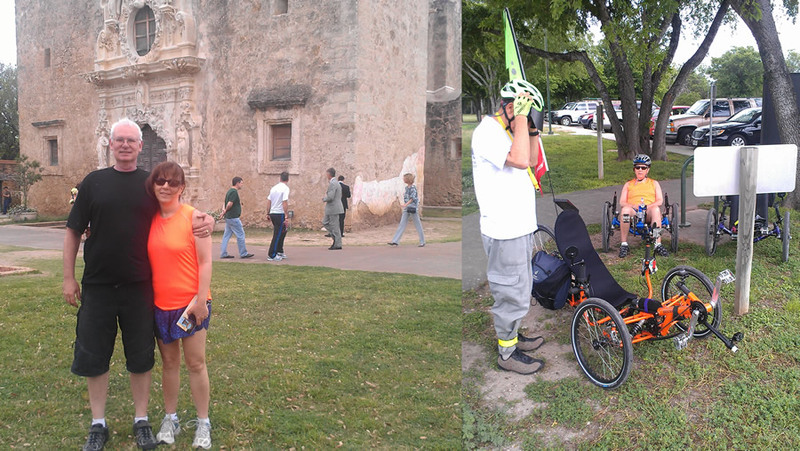 A couple weeks of riding we participated in Ride Ataxia, and rode along side Kyle Bryant for about 7 miles. About a week later (April 13 2012) was when gravity altered the course of things a bit - literally. Rounding a blind turn, really sharp blind turn she went off the road and 8 feet down into a concrete drainage culvert. Not sure which is more correct here; either her leg broke the fall, or the fall broke her leg. I would say its probably the former as her leg wasn't just broken, it was shattered. With 300 miles on the clock. Never mind that she had 21 pieces of metal holding her bones together, 3 months later she was on her Catrike pedaling a trainer. It was another 4 months until she could ride again. Now lets talk about the Catrike. What kind of damage do you think it did? Catrikes are lightweight but they aren't flimsy. So while she was riding on the trainer I'm still putting on miles outdoors and had the urge to play with a few different Internal Gear Hubs. After testing a Nuvinci N360, Alfine 11, and Rohloff the N360 won. Retaining the triple front the N360 proved to be a perfect option for my engine. 7 months into recovery the Bonebreaker (my nickname for ortho surgeons) cleared my wife for takeoff and we were back to riding. Her strength built pretty quickly but not totally pain free. 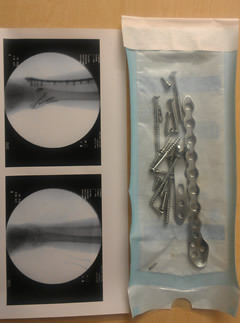 3 months later another pause on riding for her to have all 21 pieces of fine grain stainless steel extracted. Much of the pain went away but some will linger for life. From February 2013 through August 2013 we put another 1000 miles on each of the Expeditions. 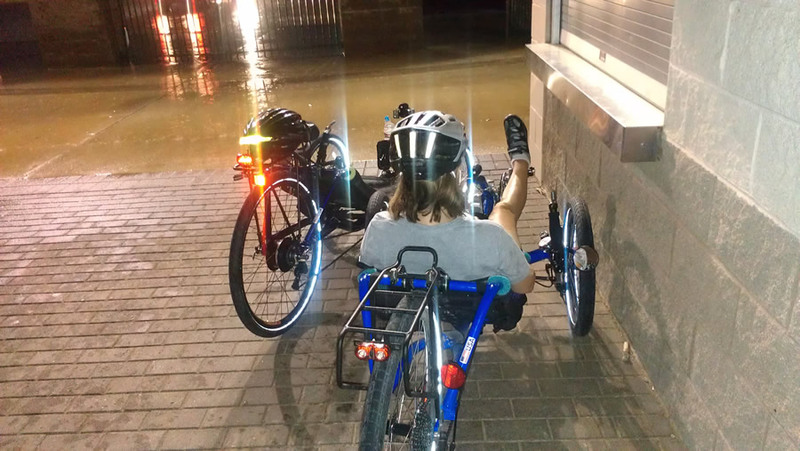 Despite being light weight we doubted they would float and waited out a gully washer under cover one evening ride. 30 minutes earlier the radar show no clouds. An hour later we had two inches of rain. The trail we take runs along a drainage canal with 18 inches of water flowing through the tunnel. We were right, the Catrikes didn't float. Her 2012 Expedition was fitted with the SRAM 10 speed. Shifters are way better then my 2011 9 Speed Shimano, but the Shimano Derailleur was way better then the SRAM Derailleur. The SRAM constantly needed fiddling. I got pretty good at riding alongside her and adjusting it on the fly, it was that bad. Replaced the shifter and the hanger with another one but its not much better. Replaced the cassettes, and no difference. One of the folks we met with a 700 said his was the same way. Replaced the derailleur once again with a better SRAM and problem solved. It appears that to keep the costs down when Catrike bumped to 10 speeds they bought a cheap derailleur. You get what you pay for. Living in Dallas its a long way to the American River Trail in Sacramento, but we've got something close to it on a smaller scale. Instead of a rockin' place like Folsom prison we have the of a Youth Camp Prison and the dams are a bit smaller too. 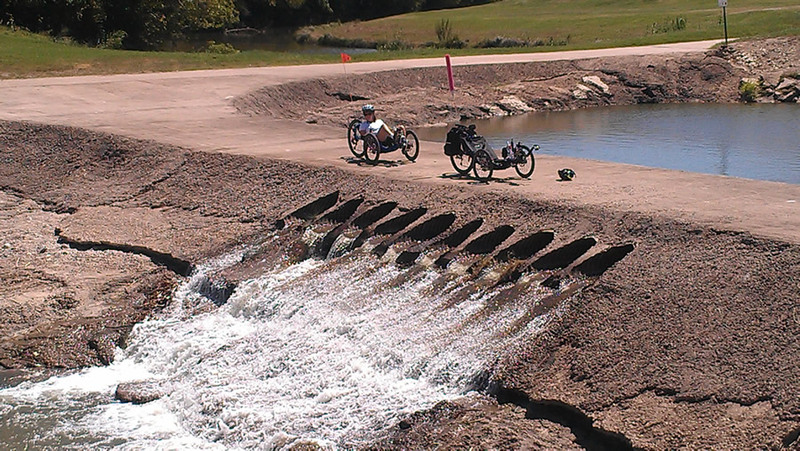 Trinity Trails in Ft Worth has over 40 miles of exceptional trails. We did 40 miles on a ride 10 months after the crash. Transporting the pair of Expeditions to some of the weekend rides started with a homemade tandem bumper mount carrier but even then we needed room to haul more stuff so we got a small trailer. Bolted the bumper mount carrier on the trailer, and here it is. 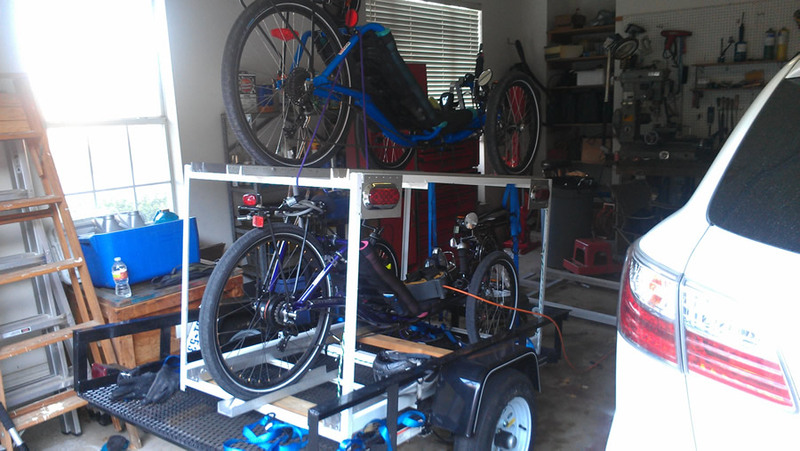 Funny thing is the trikes have more miles on the trailer then they do from pedaling. The Nuvinci N360 on mine was fully broken in by about 500 miles. It also takes about 500 miles to learn how to intuitively use it. When you're tweaking the gearing range ever so slightly up and down and barely conscious your adjusting the transmission because in effect, you're anticipating precisely just ahead of where you need any ratio you dial up. Catrike claims a weight of 35 lbs for the Expedition, mine weighed in a bit under that. By the time I added lights, cargo rack, mirrors, Big Apples and the N360 it tipped the scales at 41 lbs. Texas has a lot of great riding perfect for an Expedition. 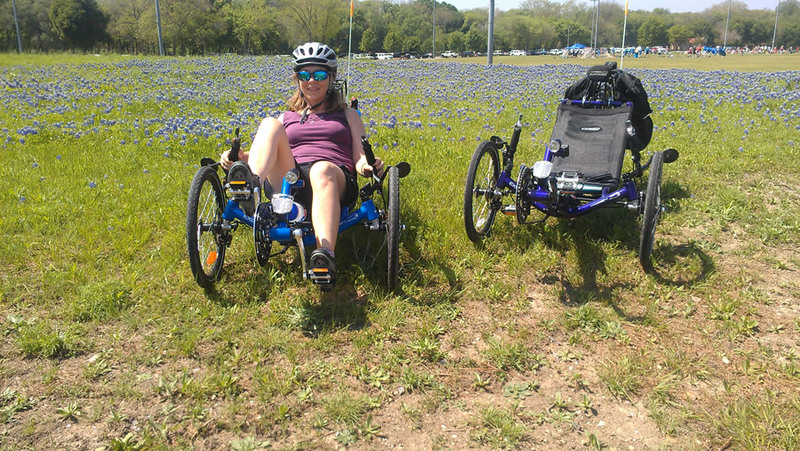 In April 2013 we hauled down to San Antonio for a total of 80 miles over the weekend, and met up with a local on a fully maxed out Steintrike. Texas does get hot in the summer so we look for a cooler place at higher elevations to ride. 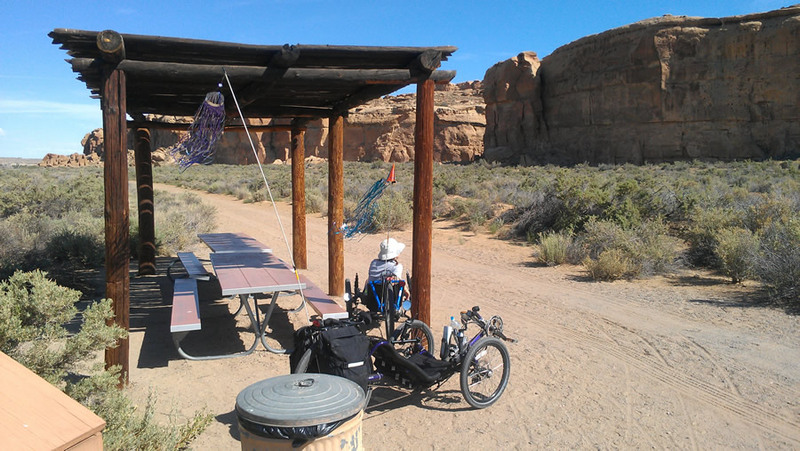 July 4th took us to New Mexico with rides in Albuquerque, Santa Fe, and Chaco Canyon. Santa Fe included a 40 mile downhill from the top of Taos Mountain down into Santa Fe. Drop in elevation was over 3000 feet not including all the roller coasters in between. Previously running Trykers in front and a Michelin 26x1.85 on the rear, stability was pretty good but over about 35 MPH downhill took a bit of alacrity to avoid bumps. Running downhill on Big Apples I found the comfort zone a bit higher 40-45 MPH was often hard to stay below. There were a few hills I probably would have reached 65+ had I not held on the brakes. The EBC Gold pads never faded although one rotor was later replaced as it warped. Fortunately we had the spare wheels with us on the trip. About 1500 years ago Chaco had plenty of water that evolved into a rich Native American culture for nearly 1000 years until the river dried up. This pueblo is well over 1000 years old. 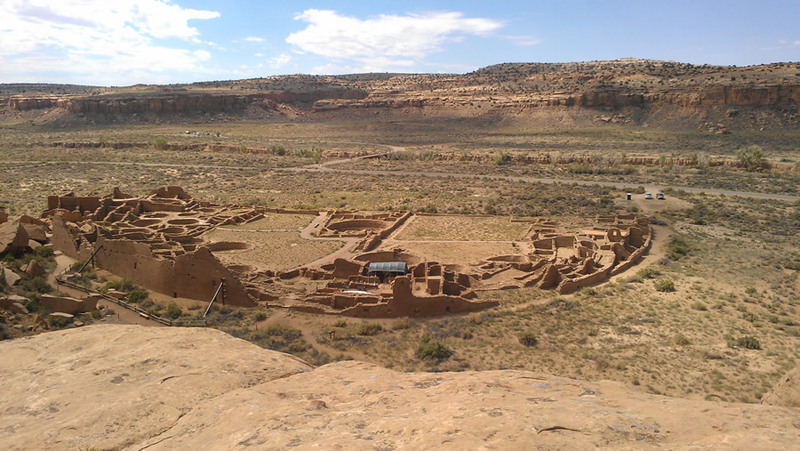 Elevations ranged from 5000' in Albuquerque to 6500 in Chaco Canyon, to 7200 in Santa Fe and over 10,000 on Taos Mountain. In the rare air altitudes one pedals just a little bit slower. August in Dallas doesn't offer ideal riding conditions. Daylight hours are just plain hot and once the sun goes down its a bugfest for a few hours. We don't do early morning anymore. Direct steering is stunningly responsive, and part of the reason I chose this as my first trike. Back-to-back test rides included an ICE Sprint, HPV Scorpion FS20, Terratrike Sportster(?) Catrike Road, and Catrike 700. Price was not an issue, the Expedition just felt the best to me. Stability on nearly any trike takes a while to give a fair evaluation. Compared with other similar trikes the Expedition is surprisingly stable but despite the wider stance not as stable as the ICE Sprint with a hardshell seat. Having a mesh seat leaning into a turn is a little more difficult then on a hardshell, but as a daily unsuspended rider the mesh seat wins the day. On the day of the test ride the Catrike 700 was clearly the most stable but I knew the neckstrain wasn't going to work for me on extended rides. Considering the frontal profile the Expedition is surprisingly stealth to the air. My peak speeds on a flat in both directions is a tick over 28 MPH. My best average speed over a mile of flat (mostly flat, maybe 10-15 foot climb)in no wind is 24 MPH. My average speed on daily rides that includes a few stops is between 12-14 MPH. Maintenance has been pretty reasonable although the rear wheel and cheap 10 speed SRAM derailleur were a bit annoying. The only other quality points were with the powder coat. The Electric Blue color was fairly new and its obvious the powder was poorly applied in sections with a heavy pitting under the clear overcoat. The clear overcoat on the Candy Purple is really soft, almost like it came out of a spray can. All of the rotating parts spin with an uncanny lack of friction. Its the lowest weight in its class and thanks to the integrated seat "spaceframe" design its relatively stiff and robust. It cuts through the air like a knife. Adding to my delight, its made in America. Never mind that the components are all from Taiwan the fact that Catrikes is an American company with American craftsman cutting/bending/welding/painting/assembling & shipping is a really big deal to me. It should be for you too. During the month of August 2013 we were ready to upgrade. We both like hardshell seats and to be practical that requires suspension. 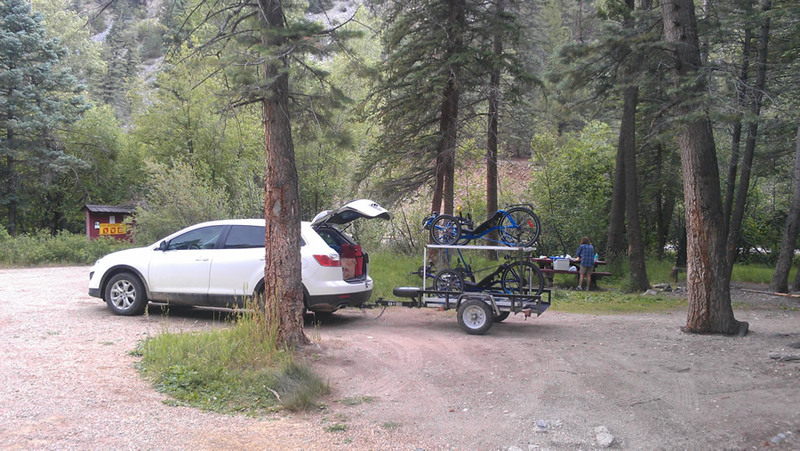 Also would like to leave the trailer at home on the weekends we transport the trikes. Took a test ride on the HPV Scorpion FS26 and were hooked. Ordered a pair of them which is a whole 'nother story in itself, but we couldn't sell the Expeditions.